As enterprises move their internal data and customer information to the cloud, it becomes imperative that certain security standards are met so that customer data stays protected and the privacy of the customer is maintained. While the need for cloud compliance discussion has heated up lately, a fact to be observed here is that the compliance rules haven’t changed drastically. But the enterprises need to shed their lackadaisical approach and be clear about the implementation of security policies in accordance with the compliance protocols. Many businesses have already moved to cloud, and since most of them operate in hybrid kind of work environment or shared cloud environment, it becomes all the more crucial that they brace themselves up for compliance beforehand rather than suffer the consequences later. Too much of delay will leave them in quandary regarding the right processes and the right technologies and will lead to the implementation of wrong strategies; thus giving rise to more errors. Even though, small enterprises lack adequate resources and funds, timely deployment of cloud security will help them to understand the need of cloud compliance in an efficient and practical manner; thus making use of the limited resources prudently. Do not wait till the compliance becomes an obligation that has to be followed: Achieving compliance standards may be the stumbling block for cloud security, but that does not definitely mean that it can be taken up at a later time depending on your convenience. Compliance need may arise from the law, partners or customers; and it pays if you are well prepared ahead of time. One of the best approaches would be to put all the appropriate business practices in place since waiting and then planning at the last moment will prove to be a futile exercise. A good CASB solution will help enterprises achieve cloud compliance. Time is required to assemble resources to meet cloud compliance: Any enterprise will face shortage of efficient staff if compliance has to be implemented at the eleventh hour. Many of the existing staff of the enterprises will be unaware of the technical jargon of compliance standards like HIPAA, PCI DSS etc and the way it has to be implemented. Hence, preparation to meet the compliance laws needs time and resourceful staff who can be trained to work within the frameworks applicable to achieve the cloud security protocols. New cloud-based environments require latest up-to-date technologies: Since the dynamics of cloud environment are ever-evolving, enterprises cannot do away using the conventional technologies for achieving compliance standards. Many of the enterprises run in hybrid cloud or shared cloud environment and the current intricacies demand that newer frameworks are implemented. A proper customized CASB solution as per the requirements of the enterprise will ensure that proper monitoring, threat detection, work insights and compliance reporting are achieved in a single integrated console. Bad strategies in cloud compliance can cost the enterprises dearly: A proper strategy has to be designed to achieve cloud compliance. A wrongly thought out plan to suit the budget requirements may leave gaps in the security systems. Also, when enterprises are short of time, they end up paying more on compliance solutions, which would not serve their purpose. Some solutions may address some of the enterprise needs while neglecting the rest. The best approach would be to opt for a customized CASB solution suited to the enterprise that will save time, fund and resources. 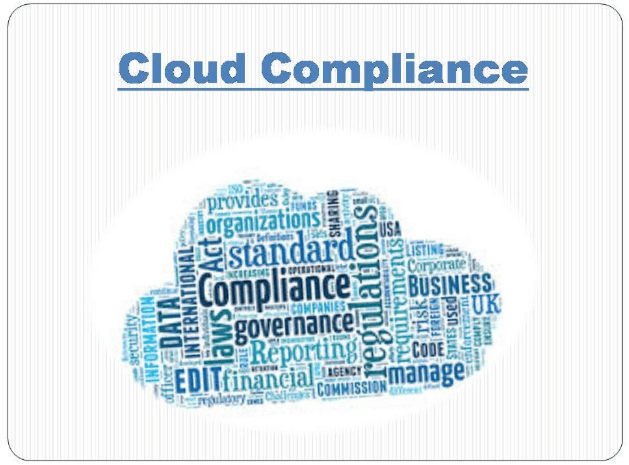 Every enterprise has to start understanding need of cloud compliance immediately. This will mean that they can harness multiple business benefits that come with achieving cloud compliance. CASB solutions are strategically well-thought-out answers having the right technological components that help enterprises to achieve their desired cloud compliance targets with efficiency and help secure their data on the cloud in a hassle-free way.